From The Empire Strikes Back! Faithfully recreated prop replica of the Snowtrooper helmet. Ramp up your collection of Star Wars prop replicas with this amazing version of the clean standard Snowtrooper helmet from Star Wars: Episode V - The Empire Strikes Back! 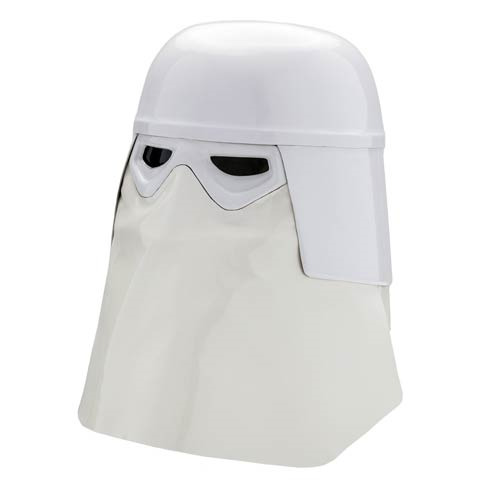 Utilizing the best features of the various helmets made from the classic Star Wars trilogy, this Star Wars Episode V The Empire Strikes Back Snowtrooper Standard Clean Helmet Prop Replica features faithful detailing and looks just like it did in the film. Made from ABS construction, the helmet uses flat green lenses, which replicastes the style used in the original artifact. Vinyl aventail covering the face and the neck replicates the style and cut from the original prop. Complete with adjustable helmet / suspension rig that fits a wide variety of head sizes, the helmet is one-size-fits-all and even features a lined, breathable inside mesh for the helmet wearer's comfort. Helmet can accommodate up to hat size 8, or a 24-inch circumference.